Let’s talk about The New Journalism. No, goddamnit, I’m not talking about the shift from print to the Internet. I’m talking about the “new journalism” as founded and honed by the likes of Tom Wolfe, Gay Talese and Hunter Thompson — writers who, in the 1960s and 1970s broke out of the “who, what, when, where and why” box and began writing long, powerful nonfiction stories that examined a subject inside and out and had spines consisting of scene-by-scene construction. Wolfe, one of New Journalism’s trailblazers, died Monday in Manhattan at age 88. Among other things, he wrote “The Right Stuff,” about the first American astronauts, and “The Bonfire of the Vanities,” a portrait of greed and vanity in New York in the 1980s. My favorite piece of New Journalism writing, however, was Gay Talese’s “Frank Sinatra Has a Cold,” which appeared in the April 1966 issue of Esquire magazine. The story forever intertwined the two men, even though they lived on opposite sides of the country and had very little in common. (Talese is 86 and living in New York City; Sinatra died 20 years ago yesterday at age 82 in Los Angeles. When I first read “Frank Sinatra Has a Cold,” perhaps in my 20s, I was spellbound by it. I always loved Sinatra’s singing and found him to be a fascinating but repulsive person. I was also in the early phase of my writing career and was hungry to read a wide variety of writing styles. What Talese managed to do in that story was open a window to Sinatra’s life and perch the reader outside the window and let him (her) sit and watch parts of Sinatra’s life and personality unfold. “Frank Sinatra, holding a glass of bourbon in one hand and a cigarette in the other, stood in a dark corner of the bar between two attractive but fading blondes who sat waiting for him to say something. But he said nothing; he had been silent during much of the evening, except now in this private club in Beverly Hills he seemed even more distant, staring out through the smoke and semidarkness into a large room beyond the bar where dozens of young couples sat huddled around small tables or twisted in the center of the floor to the clamorous clang of folk-rock music blaring from the stereo. The two blondes knew, as did Sinatra’s four male friends who stood nearby, that it was a bad idea to force conversation upon him when he was in this mood of sullen silence, a mood that had hardly been uncommon during this first week of November, a month before his fiftieth birthday. 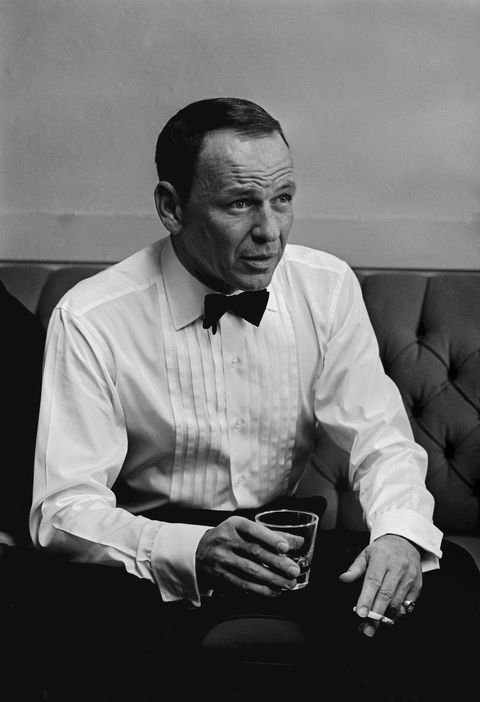 “Sinatra had been working in a film that he now disliked, could not wait to finish; he was tired of all the publicity attached to his dating the twenty-year-old Mia Farrow, who was not in sight tonight; he was angry that a CBS television documentary of his life, to be shown in two weeks, was reportedly prying into his privacy, even speculating on his possible friendship with Mafia leaders; he was worried about his starring role in an hour-long NBC show entitled Sinatra—A Man and His Music, which would require that he sing eighteen songs with a voice that at this particular moment, just a few nights before the taping was to begin, was weak and sore and uncertain. Sinatra was ill. He was the victim of an ailment so common that most people would consider it trivial. But when it gets to Sinatra it can plunge him into a state of anguish, deep depression, panic, even rage. Frank Sinatra had a cold. “(W)hen one of his men brought him a frankfurter with catsup on it, which Sinatra apparently abhors, he angrily threw the bottle at the man, splattering catsup all over him. Most of the men who work around Sinatra are big. But this never seems to intimidate Sinatra nor curb his impetuous behavior with them when he is mad. They will never take a swing back at him. He is Il Padrone. “Shortly before seven p.m., Jack Entratter, a big grey-haired man who operates The Sands, walked into the gambling room to tell some men around the blackjack table that Sinatra was getting dressed. He also said that he’d been unable to get front-row seats for everybody, and so some of the men—including Leo Durocher, who had a date, and Joey Bishop, who was accompanied by his wife—would not be able to fit in Frank Sinatra’s row but would have to take seats in the third row. When Entratter walked over to tell this to Joey Bishop, Bishop’s face fell. He did not seem angry; he merely looked at Entratter with an empty silence, seeming somewhat stunned. “Frank Sinatra stopped his car. The light was red. Pedestrians passed quickly across his windshield but, as usual, one did not. It was a girl in her twenties. She remained at the curb staring at him. Through the corner of his left eye he could see her, and he knew, because it happens almost every day, that she was thinking, It looks like him, but is it? Enjoyed your article from beginning to end! Thanks, cousin…I wish I could write like that! Do you know what was Sinatra’s reaction to the article? I can’t imagine he was pleased. I don’t know what’s more off-putting: his enormous ego or people’s (Bishop’s) fawning. I’d like to know what Ol’ Blue Eyes” reaction was, too, Gayle. I haven’t come across anything that gives an indication. One thing I didn’t say — and maybe you could figure this out from the excerpts — is Sinatra steadfastly refused to give Talese an interview. He did the whole thing by interviewing other people and being able to work his way into Sinatra’s presence a handful of times or fewer. One article I read quoted Talese as saying he interviewed more than 100 people for the piece. In addition, he (Talese) had a singular and unconventional approach when it came to direct quotes. That is, he didn’t use a tape recorder and it’s not clear how many notes he took. For interviews, it seems, he relied for the most part on memory and his sense of what the subject said. Which in its own way is sort of egocentric, isn’t it? I don’t know that his approach to quotes is all that uncommon. Rich Hood once shared with me that he always cleaned up Joan Finney’s quotes because she was pretty goofy. And the guy who covered me for The Kansan when I was chair of the party in WYCO always had to call me first thing in the morning owing to his deadline. Despite the fact that I was barely awake I was always stunned at my brilliance even at that early hour. Quotes are always a bugaboo. 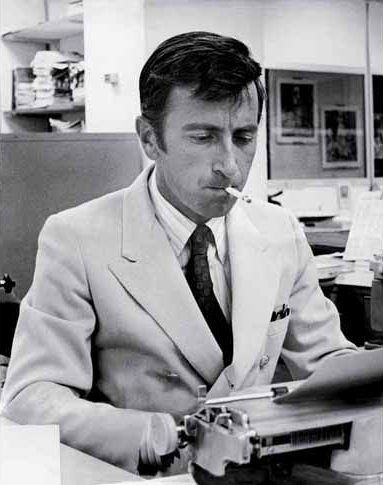 When I started out as a reporter on my college newspaper, I used to take liberties, a la Talese. That is, until a guy who I quoted came up to me one day and said, “I didn’t say that.” After that, I always tried to take really good notes and not quote unless I had it precisely right. Many times I wouldn’t be able to use quotes because I couldn’t read my writing or the speaker got so far ahead of me that I couldn’t complete the thought in my notes. Now what I do is take a few notes and just keep my ear open for one or two good, relatively short quotes. If I have to, I’ll just ask the subject to repeat what he or she said. In most cases, they will repeat it word for word, and I’ve got my quote. …Carol Marinovich was difficult to quote accurately. Smart as she is, she frequently spoke in fragmented and incomplete sentences. However, one thing she told me at lunch one day in 2002 — Jan. 4, to be precise — stood out so strongly for me that I wrote it down on a Post-it Note and dated it, and I’ve got it in my KC Star file — an actual manila file folder, not electronic. That day, I asked her why she had decided to run for mayor back in the mid-1990s. The way she led KCK and Wyandotte out of the wilderness of strip bars and crooked government is absolutely amazing; I’ve never seen one person have such a dramatic effect on a city and county that size. Phenomenal legacy.